This twist on a taco recipe is a delicious and fast weeknight meal, even with the 20 minute marinade. Place fish in a medium size dish. Whisk together the oil, lime juice, chili powder, jalapeno, and cilantro then pour over the fish. Let marinate for 15 to 20 minutes. Remove the fish from the marinade and place onto the hot skillet. Grill the fish for 3 minutes then flip and grill an additional 3 minutes. Transfer to a plate and let rest for 5 minutes before flaking the fish with a fork. Warm the tortillas in the microwave between two damp paper towels. 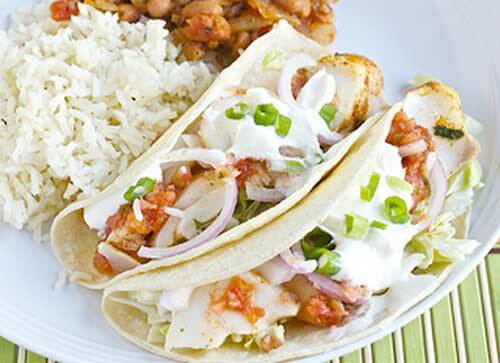 Divide the fish among the tortillas and garnish with any or all of the garnishes.